Last edited by user8012 on Wed Mar 04, 2015 5:42 am, edited 15 times in total. 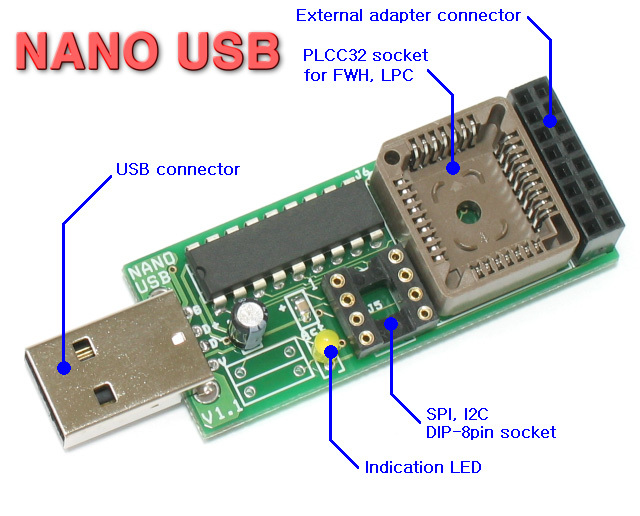 Do Google with "NANO USB programmer". This is suitable for repairing BIOS. - Include PLCC32 socket and DIP8 socket. Available on EBAY for $24 (include a shipping charge to World Wide with tracking number). or $19.99 without tracking number. Programmer manual will help you when you are repairing a BIOS. Figured the download would have more info on use, but it is the same as the help file posted. I put a soic bios from a asus m/b that had a bad boot block. This programmer didnt notice. no red flags. Sure would be nice if someone else had one and posted here. I mailed the guy through ebay and his yahoo mail- no answer. Sorry, please contact me via Ebay massege. Sometimes, Yahoo mail blocks a mail by spam filter. please give me a working email address so i can put the manual online for this thing or at least send it to people requesting it. edwin wrote: please give me a working email address so i can put the manual online for this thing or at least send it to people requesting it. Please visit next forum. Thank you.